40 inputs, a feature that blew away our reviewer. ME-1 is the cornerstone of the ME Personal Mixing System and is ready to use with the Allen & Heath dLive, iLive,˜GLD and Qu series digital mixers. ME-1 is complemented by the ME-U hub, which opens up the benefits of ME to users of other professional digital mixers via Dante, EtherSound or MADI. ME-1 also has an Aviom¸ compatibility mode for use with Aviom¸ Pro16¸ systems. Backlit rubber keys make ME-1 controls perfectly visible in the dark. The 16 user keys can be assigned to a single source (mono or stereo) or to a Group, with all the convenience of pressing a single button no matter what you want to control the vocalist mic, a stereo pair or the whole drumkit. Preset store/recall can be enabled or disabled per key to present only the control that is needed. Groups make it possible to mix up to 40 sources with only 16 keys. They also save a lot of buses at the main console: whereas other personal monitor systems rely on subgroups and pre-mixes sent from the console, ME-1 has the sophistication to˜ do it all on-board whilst remaining easy to use. 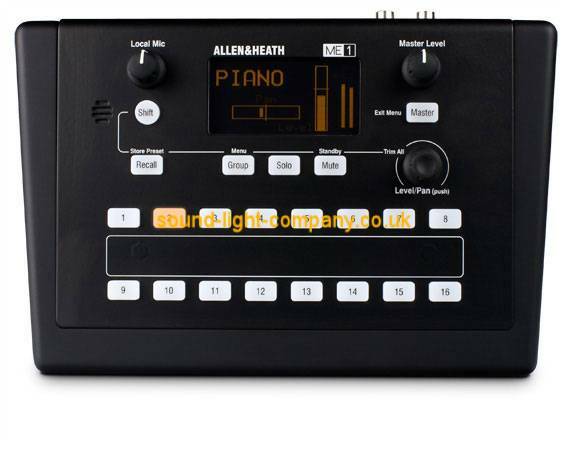 For firmware updates and˜archiving / transferring individual presets or the full configuration. Mount on top of a mic stand with the built-in 3/8 inch insert, or mount on the side of the stand with the supplied bracket.